Mid-June to June end is the time when the stone fruits ripen in the hills and reach the market. 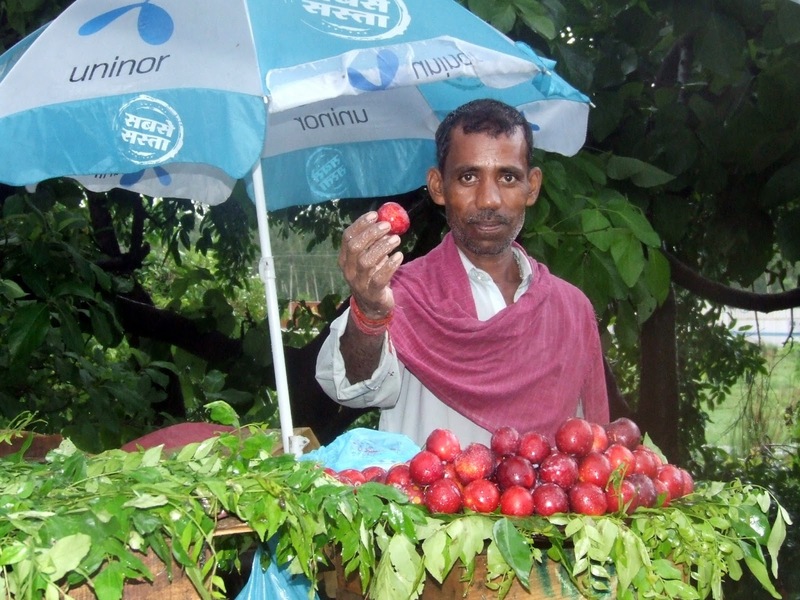 Ramgarh, Hartola, Nathuakhan, and Mukteshwar are the fruit belts of Kumaon. We get lovely big size peaches, apricots and juicy plums in abundance. This is the time when tourist season is also at its peak. Villagers erect makeshift stalls around their orchards and sell stone fruits. Tourists love to buy freshly plucked fruits right from the orchard. However, this year early monsoons marred the season. A lot of fruit could not be plucked and did not reach the market. Last week on our way back from work, we saw a fruit stall on the roadside with plums, apricots, and mangoes. We ended up buying a lot of plums and apricots. The desire to make Plum Jam got a very good reason to go ahead. We ate to our heart’s content, made jam and also made Dimply Plum Cake, a recipe that had been waiting to see the light of the day. I made plum jam in two batches. The first bottle was made in sheer excitement, the second session was to use the plums left after eating and making a cake. This is my father’s recipe. He used to pressure cook the plums and then proceed to make jam. Last year I made PeachJam with the peaches we got to pluck ourselves from an orchard. It is deeply satisfying to have a little bit of summer stored in the jars. And the jam is greatly relished when it is had in some other season when these fruits are not available. And greater pleasure is also in gifting homemade jam to your loved ones. Wash the plums and wipe them dry. Put them in the steel pressure cooker. Add water just enough to submerge the fruits to the one-fourth level. Turn off the heat after one whistle. Let the pulp cool a bit. Measure the pulp. Transfer the pulp to a steel wok. Add one cup of sugar for every one cup of fruit pulp. If the plums are very tart, more sugar may be added. Add juice of half a lemon for every cup of the fruit pulp. Cook on medium flame stirring constantly. Keep a steel plate in the freezer to test the jam. 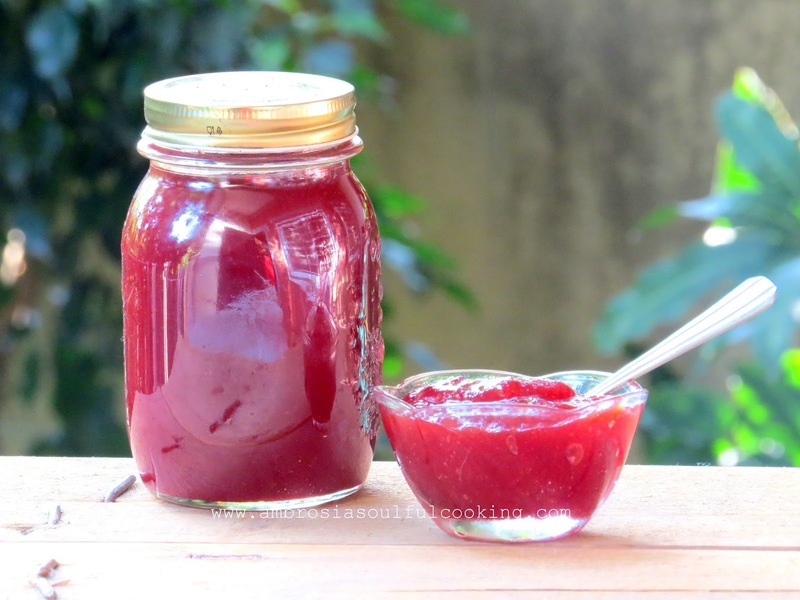 When the jam reduces in quantity almost by half and becomes thick, reduce the heat. Cook on low flame and stir constantly. When the jam bubbles and attains jam like consistency and falls from the ladle in lumps, turn off the heat. In the meantime, sterilize the bottles. Place the washed and dried bottles with the lids in the oven. Set the temperature to 100 degrees and set the timer to 10 minutes. Remove the bottles and their lids from the oven. Fill the jam in the sterilized bottles while the jam is hot. My Notes: Add more sugar if the plums are tart. If the quantity of water while pressure cooking the plums gets more, it does not make much of a difference. 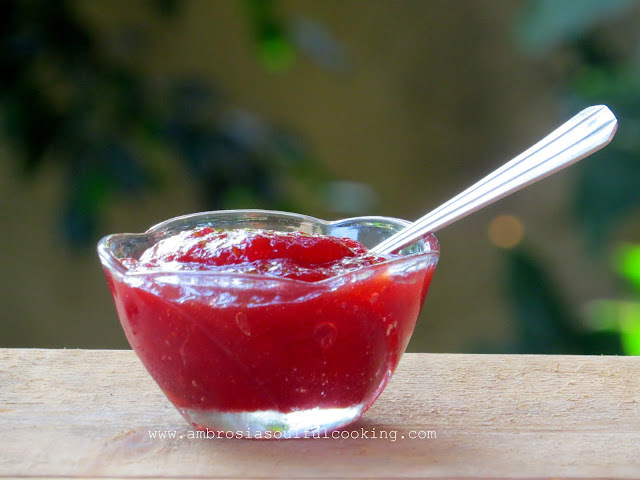 Only that you will have to cook the jam longer to get the desired consistency. This is a good idea to providing information related to jam. Jam is also good for health and I want to try plum jam. Plum jam is really looking very tempting! Thanks also to the fruiterer who supplied you rich , ripe n juicy plums! And not to ignore, your little basket is looking great!! I am amazed with the variety of things you make with fruits, love them all. I so want to pick that jar of plum jam, looks ultra amazing and yummy. Delicious! I am so partial to plum jam. I remember buying it in Nainital. 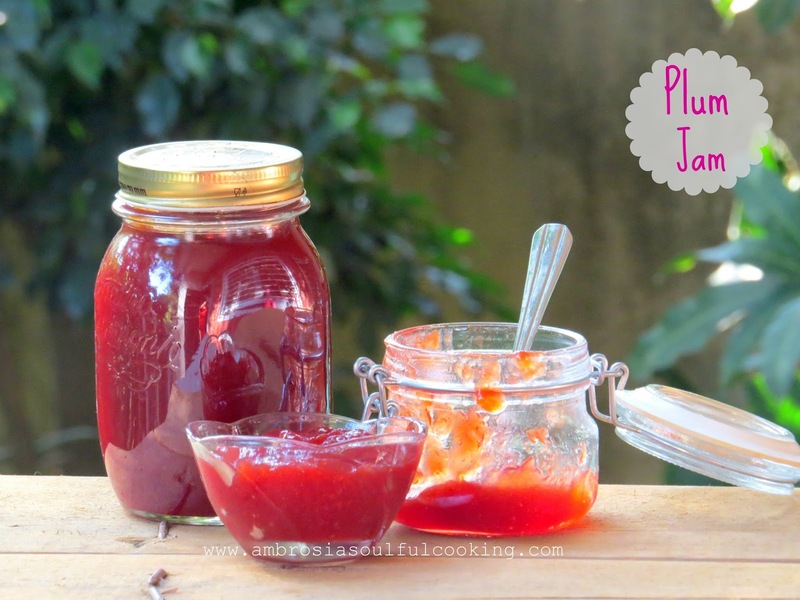 made this plum jam today Namita and its just awesome!!!! Thanks for the lovely recipe.